Surprise this weekend: Youtube and watched entered a new feature, Youtube Movies. The movie rental service already operating in the US for a year, but here was not open. The rental price of the films depends on their age and whether or not they are in high definition. The films are theatrical release in cost 3.99 euros and 4.99 euros standard definition high definition. The other movies cost 1.99 euros and 2.99 euros normal high. The service works much like Film (Which is what I used so far): when you pay the movie, you have 30 days to see if you have not started yet, and once you start, you have 48 hours to see it (you can see it as many times as you want during these 48 hours [this is practical when there are staff who are home watching TV at various times]). It seemed to me that it can only be paid through Google Wallet (Google service that competes with Pay Pal), the truth is that I have not finished the test transaction (today I do not have time to watch a movie) but only offered me the option of paying through their own tool (I hope this is not definitive because I usually use for all my Pay Pal payments). We will have to see how this service works. Let's see if I have time next weekend and taste. This conference Hans Rosling It is a magnificent example of entertaining and interesting presentation, recommended by Alvaro Gonzalez-Alorda in his book "The next 30 years"To illustrate the chapter on the need to liven up our work with illustrations that make them more understandable. In addition to a great example of how it should be introduced at the level of graphics and illustrations, Hans Rosling is a great speaker in this conference explains the evolution of life expectancy in the world, poverty, income per capita and even evolution of Internet connections. If the format is impeccable, the content and the proposed project not leave indifferent. 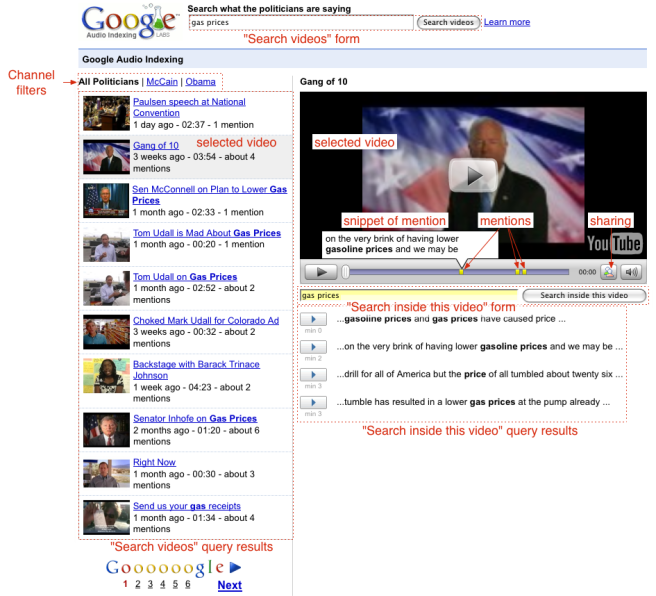 Google Audio Indexing es una herramienta de Google que se puso online en septiembre 2008 con motivo de las elecciones presidenciales norteamericanas. Desde entonces está escaneando los vídeos del canal de política de Youtube en busca de las palabras clave que el usuario solicita a través de la página web: http://labs.google.com/gaudi (“gaudi” es por G + Audi). Lo novedoso de este servicio es que utiliza una tecnología que reconoce las palabras a través de su fonética (sólo en inglés de momento) y te lleva a la parte del vídeo en la que se reproduce la palabra o la frase que te interesa. En la barra de desarrollo del vídeo también aparecen unas marcas allí donde se cita la palabra buscada y si situamos el cursor encima del punto, nos muestra el párrafo entero en el que se cita la palabra, sin tener que abrir el vídeo. Como podemos ver por la URL, éste servicio está aún en Google Labs y no ha salido a la red de forma oficial, aunque espero que lo haga en breve porque su uso es muy práctico y permite sobrellevar bien la búsqueda de vídeos que están mal etiquetados. Aunque de momento el servicio está limitado a vídeos del canal de política de Youtube, sin duda vale la pena tener en cuenta ésta tecnología cuando pensemos en las búsquedas de un futuro cercano. I just read that Google is testing AdSense for mobile applications, designed to be read from iPhones and from phones that use Android. Until now, you could only hire Adwords searches on Google from mobile devices, but not Adsense (Google ads on web pages that belong to the Google content network). It seems that this will change. In the video I show below these lines we can see one of the developers of software for advanced mobile phone, talking about how wonderful it will be able to insert ads into their applications. A couple of months ago Microsoft released this video in which some of the technological advances which are shown working and believe to have developed in the immediate future. Spectacular digital "paper" newspaper plasma screen but it is flexible type and light. Mobile devices are an evolution of PDAs and telephones, and are able to interact with any other dispotivo with which they are. Large windows transparent, ubiquitous presence, which are touch screens Minority Report (they already exist ... but not of this size). Cards and credit cards "paper" but fully interactive. Anyway ... a whole array of new devices that promise the next 10 years will be very interesting at the level of interaction between computers and humans.